As I mentioned elsewhere on the site Bartlein Barrels known to make some of the most accurate rifle barrels in the world does not make barrels for the 308 AR, AR .308 platform. Instead they send customers to Craddock Precision. 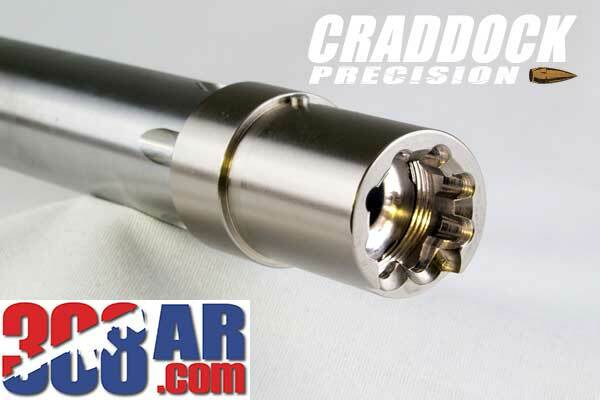 In turn Craddock is quickly making a name for themselves for making the most accurate 6.5 Creedmoor and .308 Winchester 308 AR Barrels from Bartlein and Criterion Barrel blanks. Now they are very forward thinking in offering the same accurate barrels for DPMS GII (DPMS G2) and equivalent rifles. Do you have a shiny new DPMS Gen2 and cant get it to group consistently? Well this barrel from Craddock Precision is the best aftermarket barrel you can buy to throw into your rifle to make it shoot accurate! You can choose from a Bartlein, or a Criterion Blank. Prices will vary. We also offer fluting on these barrels as well. You can pick from straight fluting, spiral fluting, and diamond fluting. This option would add 1-2 weeks on your barrel. You may choose a bead blasted or polished finish. Bead blasting would make your barrel a matte gray and polished would be a nice high shine finish!